Telecom New Zealand Archives · Stop the Cap! One of the principal components of Internet Overcharging is the so-called “usage meter,” a measurement tool designed to help customers keep track of their usage so they don’t exceed arbitrary usage allowances and face overlimit penalties or speed throttles. But with no government agency or independent watchdog monitoring the accuracy of the meter, providers can claim any amount of usage they wish, and stick customers with the bill. Telecom New Zealand is the latest ISP forced to admit its usage meter was wildly inaccurate, with nearly 100,000 accounts impacted by faulty meter measurements between November 2010 and June 2011. At least 47,000 faced punitive measures including substantial overlimit fees or throttled speeds for exceeding usage limits, even though they actually didn’t. Now Telecom has admitted the meter was wrong, it violated the Fair Trading Act in the process, and is refunding $2.7NZ million dollars in overcharges. It was either that or face substantial fines from the Commerce Commission. It’s the second usage measurement failure announced by the company this month. In a separate move, Telecom agreed to pay $31.6 million to five of its competitors overcharged for wholesale broadband service. When technically-savvy customers realize they are being billed for non-existent usage and the media takes an interest, providers eventually disclose their mistaken measurement tools. Littlejohn has already received a refund from Telecom for illegitimate overcharges he incurred earlier this year. Littlejohn says after Telecom granted one credit as a “goodwill gesture,” subsequent overcharges that went unexplained were his problem, not theirs. “After the first credit, everything else is your fault,” he says. Littlejohn caught the company red-handed when storm damage disrupted his service for nearly a week, and Telecom’s usage meter recorded 22GB of usage on his down-and-out service anyway. The Herald has received detailed internet usage logs from two Telecom customers – one in Dunedin and the other in New Plymouth – which show over-counting broadband downloads, in one period by as much as 139 per cent. Both have raised the matter repeatedly with Telecom, but have yet to get an explanation. CueClub’s data taken from its two internet routers shows an average of 62 per cent over-counting during a three month period – the worst month being May when Telecom counted an extra 118.24 gigabytes (GB) of usage amounting to $203.97 in overcharging. New Zealand’s forthcoming transformation to fiber-based telecommunications infrastructure has some important lessons to teach those interested in improving broadband in North America. While Ottawa and Washington depend on the private sector to deliver 21st century broadband, other countries are recognizing private providers alone may not be able to deliver the essential networks of the 21st century, especially in smaller communities and rural areas still bypassed by even 20th century broadband. For Korea, Japan, Australia, New Zealand, Singapore, and beyond — government and the private sector are working together to deliver advanced fiber-optic-based networks that will likely power broadband for at least the next decade or more. More importantly, they are doing so on terms that best serve the interests of the public, not just a handful of shareholders and investment bankers. Priority number one is getting advanced networks built. Marketplace realities, particularly in North America, constrain private companies from taking risks on fiber networks that will take more than a few years to realize a healthy return on investment. Without that essentially-guaranteed payback, many providers refuse to think in terms of “revolutionary” broadband, relying on incremental “evolutionary” upgrades instead. That formula has also allowed many providers to ignore rural America, deemed too costly to wire. In a country like New Zealand, these rules also apply, but in spades. Not only do Kiwis face a broadband experience that resembles service offered in the U.S. a decade ago, they are also punished by a lack of international capacity. With just one international provider delivering nearly all of New Zealand’s connectivity with the United States and beyond, prices are high and data caps are low. Domestically, many Kiwis have traditionally had just one realistic choice for broadband service — Telecom New Zealand’s DSL technology. Although competitors have been allowed to resell DSL service over Telecom’s network, the limitations of the technology remain a constant problem for every provider on that network. New Zealand has decided the best way to handle these challenges is to transform the telecommunications foundation across the country, starting with a new public-private fiber broadband network. NZ’s National Broadband Plan, dubbed “Ultra Fast Broadband,” establishes as its foundation the principle that broadband is too important to allow the country to languish waiting for private providers to step up. Rosalie Nelson from IDC – the independent market intelligence advisory service, explores the pro’s and con’s of a nationwide fiber network for New Zealand. But it’s a lesson not just applicable to broadband in the South Pacific. Stop the Cap! is sharing this video seminar with our own Viewer’s Guide to help draw parallels to broadband closer to home. As an added bonus, you will come to understand different broadband technologies we regularly discuss. To help draw comparisons with broadband in the South Pacific with that in the United States and Canada, we bring you this viewer’s guide to follow as you watch. In part one, Nelson explores the recent history of telecommunications in New Zealand, particularly focused on Telecom New Zealand, created from the former state monopoly for landlines and data circuits. Although the company began to open its network to competitors several years ago, the biggest transformation came in the last few years. New Zealand experienced its own version of the Bell System breakup, only this time that transformation came from the New Zealand government, not the courts. When complete, what was once a single company became three — one for wholesale access, namely by independent competitors reselling service over Telecom lines, retail — the public face of the company that continues to market service under the Telecom brand to consumers and businesses, and Chorus, the entity that maintains Telecom’s infrastructure. In North America, the equivalent would be the breakup of AT&T or Bell, with competitors allowed to lease access to their respective networks at prices and terms that could not favor either parent company. While the debate rages over whether broadband expansion came as a result of Telecom’s breakup, or in spite of it, one thing everyone agrees on: New Zealand is one of the fastest growing broadband markets in the OECD, with a growth rate of nearly 35 percent every two years. New Zealand’s telecom market is perhaps five or more years behind the United States and Canada. 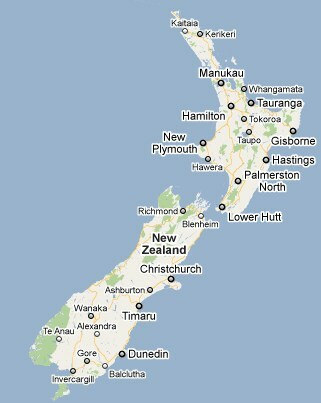 The rapid erosion of landlines for mobile or Voice Over IP service is only just starting in New Zealand. Telecom, like many phone companies in North America, still depends on the enormous pool of revenue landline service provides. Even as landlines decline domestically, phone companies like AT&T, Bell, Telus, Verizon, Frontier, and CenturyLink still treat this revenue as the critical foundation on which other products and services can be offered. It will be years before this base revenue erodes to the point of irrelevance. 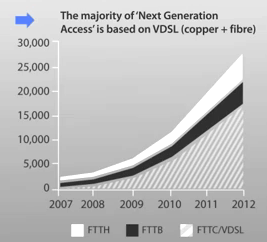 In Western Europe, VDSL has a significant head start in delivering next generation broadband. Similar to AT&T's U-verse or Bell's Fibe network, this technology delivers fiber to the neighborhood, but relies on traditional existing copper wire phone lines to reach individual subscribers. Telecom is also highly involved in the mobile market. Just as in North America, when we talk about industry investment in networks, wireless is usually the largest recipient, sometimes at the expense of the landline network. IDC, which is independently analyzing New Zealand’s forthcoming transformation to a fiber-based network, is excited about the transformational aspects of such a network, and recognizes public investment may be the only way to execute its rollout in a world where short term results and recouped investment can make all the difference between a green light and a red one among private providers. In the second part of the video, Nelson succinctly explains some of the different technologies we talk about regularly on Stop the Cap! For instance, most telephone and cable companies both use fiber cables for at least part of their network. Telephone companies like Frontier use fiber between their headquarters, local exchanges (a/k/a central offices), and occasionally even to remote exchanges, used to reduce the amount of copper wire between your home or office and their exchange. Many phone companies, including AT&T, use what Nelson calls “cabinets” to contain the interface between fiber and copper networks. These are often dubbed lawn refrigerators — big four foot metal boxes installed on top of a concrete slab or attached to the side of a telephone pole. On one end, fiber optic cable from the central office arrives. On the other, individual copper wire lines exit, connecting to every customer up and down the street throughout the neighborhood. With additional fiber, phone companies selling DSL Internet access can increase speeds and offer service where it was not available before. AT&T can use a more advanced form of DSL as a platform for its U-verse service. Bell’s Fibe service in Canada is another example of this technology in use. CenturyLink is also deploying it for some of their service areas. Cable companies use fiber to deliver their signals out to individual towns and parts of cities. From there, coaxial cable travels to homes and offices, on which we receive television, telephone, and broadband service. In large parts of Asia and Europe, cable television is much less common than it is in North America, so it’s a technology more unique to North America than to Europe or the Pacific. Nelson also reminds us fiber is increasingly important for cell phone companies too, which use the technology to support the increasing amount of traffic that passes through cell towers. Fiber can help keep mobile broadband speeds at a reasonable level during peak usage periods. Where fiber isn’t available, the maximum amount of data that can travel between the cell tower back to the cell phone company’s data center can be significantly lower. Nelson’s larger point is that there is a very real cost-benefit analysis to explore when considering whether the next generation broadband network should be 100% fiber-based, such as Verizon’s FiOS network, or a combination of fiber and more economical, already installed copper wire, such as AT&T’s U-verse. The initial expense of providing 100% fiber, direct to the home, is greater than repurposing part of our existing landline network. But with current technology, fiber can deliver a faster and more reliable level of service, and is future-proof. It also requires less maintenance once installed. In the third part of the video, Nelson explores the political landscape in New Zealand, and with some minor differences here and there, the gap between the telecommunications market in Canada and New Zealand is not too different. 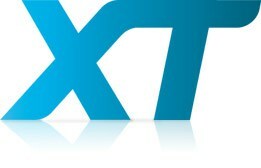 Xtra, the ISP owned by Telecom New Zealand, remains the country's largest service provider. 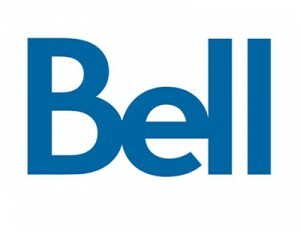 While the United States broke up the Bell System in the mid-1980s, Canada still relies heavily on behemoth Bell/BCE to deliver broadband access throughout the Atlantic provinces, Quebec, and Ontario. SaskTel and Telus deliver service to central and western Canada. Cable companies, primarily owned by Rogers, Shaw, and Videotron deliver service in major Canadian cities and nearby suburbs. In New Zealand, Telecom was the former state-controlled monopoly telephone company. In recent years, that monopoly has been broken up, but broadband still relies heavily on Telecom’s landline network to deliver Internet access, primarily by DSL. In the past, Telecom was -the- Internet Service Provider. But now the company must sell access to their last mile network to all-comers at a regulated wholesale access rate. Canadians will recognize this kind of wholesale access policy — Bell has one for independent service providers to this day. In the United States, things are a bit different. While there are instances of competitors providing DSL through landlines owned by familiar phone companies like AT&T, Verizon, CenturyLink, Frontier, and Windstream, very few customers know about them. Instead, cable television is the more familiar competitor, and the two players regularly beat each other up in marketing campaigns. If you ask an ordinary American consumer what companies sell broadband service, they will typically answer with the name of the telephone company and the cable company, if one serves their area. They are unlikely to answer Earthlink, which sells service over some telephone company and cable lines. Some of Nelson’s anaysis about the changes in policy relating to the Ultra Fast Broadband network are no longer in effect with last week’s decision to abandon the “regulatory holiday” concept. The government’s original fiber network proposal has been modified repeatedly to fit into the business realities of the New Zealand ISP market. Some examples include recognizing the value and importance of the existing copper wire network, which will remain relevant in some rural areas not scheduled for wireless or fiber access — and will of course also be in operation as the fiber network is built. The government is also trying to promote private investment, and under pressure from large telecom companies, the government in power is looking for ways to assure investors of a return on their investment. Critics have charged the government leaned too far towards providers in effectively handing them at least eight years of monopoly service under a “regulatory holiday,” without oversight by the all-important Commerce Commission. A revised proposal seeks to guarantee investors a certain level of return, even if prices drop in the future, but retains regulatory oversight. This policy is unique to New Zealand, and has not been tried in North America. Canada’s national broadband plan is long overdue and the one in the United States relies on some government stimulus money to incrementally expand broadband in unprofitable rural areas, but relies mostly on private providers for the bulk of the expansion. The Federal Communications Commission is exploring revamping its rural subsidy currently charged to every telephone line in the United States with the hope of diverting money to broadband development in rural areas. Private providers are expected to upgrade their networks through private investment for most of the rest. New Zealand is proposing a totally new way of delivering broadband service with the establishment of an independent company responsible for the fiber network — a company not affiliated with any Internet Service Provider. That would make Telecom New Zealand no more or less important than any independent provider. Each ISP will succeed or fail based on price and value-added services, because the basic network experience is likely to be the same regardless of the provider selected. Some may deliver speed boosting features or sell content to customers. Others may deliver cheaper, slower speed plans for budget-minded customers. Some might even bundle free tablets or computers in return for fixed-length contracts. But Nelson explains there is a risk. Once a fiber network is in place, it effectively becomes a utility, and it may or may not be able to earn sufficient revenue to embark on innovative new technologies that venture capital might otherwise afford. Because of market dynamics, for the same reason very few North Americans cities have more than one cable and one phone company, investors are unlikely to pour money into a competing technology if a fiber network is dominant. For a legacy phone company like Telecom, past regulatory requirements are also under review at the request of the telephone company. Telecom argues if a national fiber network is to be established, Telecom should be freed of its regulated responsibility to continue investing in its copper network, and the facilities used to support it. This is similar to arguments AT&T and other phone companies have been making in their efforts to secure deregulation at the state level, for but different reasons. AT&T, as an example, argues that their aging copper wire network and its upkeep is a responsibility it agreed to in a different era, when landline service was ubiquitous and virtually everyone had a traditional phone line. Phone companies argue that as landline disconnections accelerate, the regulatory responsibilities assigned to it are no longer fair, and requires the company to continue investing capital in a network fewer and fewer customers are using. They argue investments would be more appropriately spent building next generation broadband and wireless networks. AT&T might have a point, except for the collateral damage impacting rural customers, which AT&T may decide to abandon for the same reasons the company uses when it won’t provide broadband in rural areas — return on investment considerations. Those investments AT&T seeks to make would disproportionately benefit urban customers, at the expense of rural ones. In the fourth part, Nelson explores the impact of the fiber project on Telecom, which is considering restructuring itself to compete under the new broadband model. Nelson argues the company’s revenues are expected to be flat in the near future and predicts Telecom will be forced to begin a cost-cutting program, simplify its business, and target growth areas. Nelson ignores the most common strategies providers have used in this arena, however. In addition to job cuts, the other common way to increase revenue is to raise prices. Chorus, which administers Telecom’s broadband network, is the only real money maker inside Telecom these days, and that comes from broadband demand. ...Even When They Are Thousands of Miles Apart. Nelson, like investors, opposes anything resembling a price war in New Zealand, one that could come as copper-based DSL providers slash prices to remain competitive with service on the much faster (but likely more expensive) fiber network. She sees such competition as a “war of attrition” where shareholder value is lost, along with incentives for further private investment. Nelson’s final question ponders whether Telecom, still a dominant player in the New Zealand market, has the ability to change and adapt fast enough to the country’s fiber network. Conversely, we wonder if Telecom will attempt to throw up roadblocks in an effort to curtail the new network as a defense strategy against those required changes to its business model. We also wonder how much return on investment will be sufficient for investors. For some, anything short of “the sky is the limit” may fuel investment of a different kind — into special interest campaigns and lobbying to ensure there is no limit on the money they can earn from a network that could have a monopoly position in the marketplace. 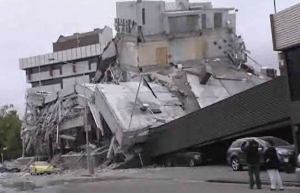 A major magnitude 6.3 earthquake has devastated the Canterbury region of southeast New Zealand, particularly the central business district of the city of Christchurch, knocking out power, water, sewer, and several telecommunications networks across the region. The wireless networks that remain have been so overburdened, government officials have declared use of those networks limited to emergency use only. Two aftershocks — one magnitude 5.6 and another 5.5 — shook Christchurch within hours of the initial 6.3 earthquake, causing damaged buildings to crumble, including parts of the 130-year-old Christchurch Cathedral. Its spire toppled into the city square, falling onto throngs of tourists who ran from the building in terror as the temblor struck. Dozens are dead, with scores more injured, particularly in the Christchurch city center, where the quake struck just after lunch. 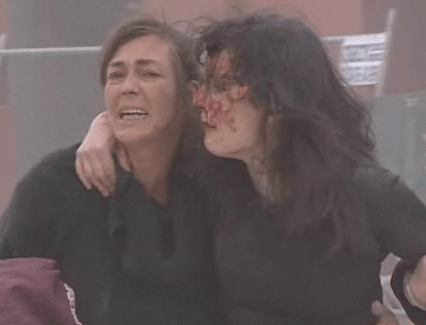 Shocking raw video has appeared on national television showing bloody bodies strewn amongst the rubble, and hearts are broken over stories such as the death of nine month old toddler who survived the quake, but not the large flat panel television that toppled down on him during an aftershock. Telecommunications services were reduced to a state of virtual unusability following the quake because of cable cuts and congestion, as Prime Minister John Key informed Parliament the government was forced to initially rely on a sketchy satellite link to speak with civil defense officials in the city of 376,000. The city’s local television station — CTV, was reduced to rubble as the seven-story building pancaked, tossing some employees working on the fifth floor into the middle of Madras Street below. They were the lucky ones, surviving as astonished onlookers ran up to help. 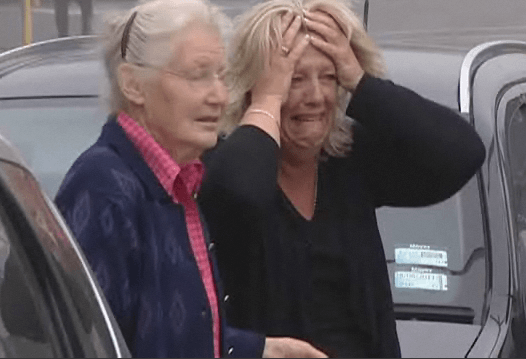 National media has described the Canterbury earthquake as “New Zealand’s darkest day,” and most radio and television stations still on the air have ceased regular programming to relay the country’s National service from Radio/TV New Zealand, or the country’s national news-talk network Newstalk ZB. New Zealand’s Internet services are functioning, but sporadic in many locations. The national public broadcaster, Radio/TV New Zealand, is relying on its international shortwave radio service Radio New Zealand International to get its signal out to the rest of the world as its live Internet streams initially failed. Many other broadcasters in Christchurch have lost their links to transmitters, or temporarily lacked power to stay on the air. The region’s landline telephone network remains functional where cable cuts have not interrupted service, but since many New Zealanders rely on cell phones, the country’s wireless networks quickly were overwhelmed with worried callers. Large parts of New Zealand’s cell phone network in the south is now completely reliant on battery backup power, due to widespread power disruptions. Keeping those sites operational is critical, as scores of office workers in Christchurch are texting messages indicating they are still alive, but trapped in damaged or collapsed buildings. Emergency generators are being pressed into service as providers recognize their wireless networks are often the only reliable link residents now have with the rest of the country. Some cell sites operated by Telecom New Zealand (TNZ), Vodafone and 2Degrees equipped with solar or battery backup systems began to fail last night. “We’re asking our customers in Christchurch to have patience if they lose service. Although we can’t identify which sites will lose battery power or when, we know that they are generally in good shape so can be placed back in service once power becomes available,” says 2degrees CEO Eric Hertz. TNZ and their biggest competitor Vodafone have set aside their rivalry and are coordinating efforts to keep the country’s networks up and running. Staff of both companies have been largely ordered to remain home, as technicians on duty at the time of the quake pull overtime duty. Emergency 111 service, today answered by operators in Wellington 190 miles away, is now prioritized and customers have been told by government officials that cell phone use in the affected region should be limited for emergency calls only. All public payphones in Christchurch discontinued paid service as of this morning — all calls are now free. Vodafone reports SMS text messaging service between networks is not functioning at this time. That means Vodafone customers cannot send or receive text messages to anyone outside of Vodafone’s own network for the time being. All three carriers are recommending wireless customers across the entire country use text messaging rather than calling to keep congestion to a minimum. Text messages rarely overload wireless networks. Most providers are also waiving contract cancellation penalties for customers whose homes or businesses were heavily damaged or destroyed, and will forward calls to functioning phone numbers at no charge. Cable modem service in Christchurch is disrupted wherever cable cuts exist. DSL from TNZ is also sporadic for the same reasons. While power is expected to return across Canterbury as daybreak now arrives, officials warn outages in essential services will persist for days, if not weeks, in some particularly hard-hit areas. When the 60 Minutes franchise shows up to run a 15 minute story on your corporate crisis, you know you’re finished. The scene: Telecom New Zealand’s heavily-marketed XT mobile broadband 3G network has collapsed for the fourth time since December, leaving hundreds of thousands of customers without service, government ministers apoplectic about ongoing service problems, and now resignations among senior Telecom officials falling on their swords for endless technical faults that bring excuses and promises of better service that never quite come true. One Telecom solution: Video their customer service center’s employees trying to cope with a telecommunications crisis in the country in hopes the carefully edited footage, made available to the media, would humanize the company’s own incompetence. It didn’t work as Telecom New Zealand’s 3G customers rushed for the nearest exits, canceling service and demanding no fee be charged for doing so. To add insult to injury, after four network crashes, Telecom’s administration of the country’s emergency help line 111 (equivalent to 911 in North America) revealed lapses there as well, when the line suddenly stopped working for several hours. The problem was discovered not when a Telecom technician discovered it, but rather when a police officer found it strange there were no calls to respond to and called the number himself to test it, finding no response. Telecom New Zealand is under fire as consumer groups, business leaders, and customers condemn the company for a second major outage wiping out wireless mobile broadband and cell phone service for tens of thousands of customers on the South Island. Dunedin, Invercargill, Timaru and Queenstown were among the areas worst affected for the service problems impacting the company’s much-touted “XT” WCDMA network. Affected customers could not access mobile broadband, send or receive text messages or phone calls for several days. Company officials believe a piece of hardware installed at multiple cell tower sites is responsible for the network outages. It’s just the latest of a never-ending series of problems for New Zealand’s largest telecommunications provider. In December, a botched software upgrade brought another major outage for the provider, which now risks being defined by customers as unreliable. 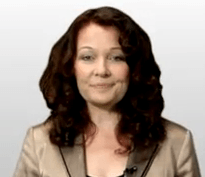 The expensive promotional campaign launching the “XT” 3G UMTS network was itself highly controversial when the company decided to use British actors in its advertising campaign, annoying New Zealanders. Although a company official touted the “world class advanced XT network” as capable of speeds better than 20Mbps, the company’s website notes average customers are more likely to find speeds somewhere in the 3Mbps/750kbps range. “After marketing XT as a Rolls-Royce brand, Telecom will be looking at ways to rehabilitate it in consumers eyes,” telecommunications analyst Rosalie Nelson told the New Zealand Herald. Telecom is also donating more than $250,000 to community projects across the lower South Island. The company’s problems got extensive media coverage, including daily reports on New Zealand’s national news. Customers were outraged, many spending hours trying to reach Telecom by phone. Many others argued their way out of service contracts, penalty-free, and switched to Vodafone, the country’s other major wireless provider.